Danielle Joliet called education a "portal to a new life." A high school dropout, U.S. Army veteran and mother of two shared her inspirational story of how she went back to school and graduated from Pennsylvania State University on "Good Morning America" today, as "GMA" honors some of this year's graduates who have overcome obstacles and inspired others with their educational journeys. 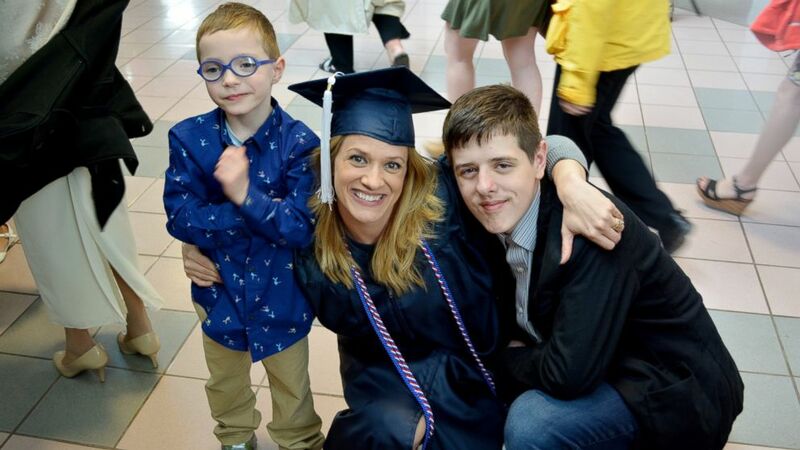 Danielle Joliet, 34, earned her degree in Rehabilitation and Human Services from Penn State's College of Education this past Sunday. The mother of two boys was a high school dropout who obtained her GED and joined the U.S. Army before she went back to school. Joliet told ABC News that she originally joined the military at age 17 to escape a troubled youth. "I kind of woke up one day wanting a better life and not knowing how to do it, and for me that was going into the United States Army," Joliet said, adding that her military career spanned a decade. "My identity very much got wrapped up in alcohol and drugs," Joliet said. "As I went into the Army and I had ... some success. There I started to gain a little bit of confidence in the structure of the military. I really started to flourish. It was the first time that I saw that I could be a lot more." Joliet said her struggles with substance abuse continued until she became pregnant with her first son, Randy, at 18. "I knew when I would look at him that I had to do better," Joliet told ABC News. (Danielle Joliet) "GMA" honored Danielle Joliet, a U.S. Army veteran and mother of two, after she graduated from Pennsylvania State University this year. While deployed in Baghdad, Iraq, in 2008, Joliet sustained an injury that ended her military career. "When they first Med Evac-ed me out, I thought I was going to go back," Joliet said. "Not being able to come home with my unit was painful." Joliet said she was inspired to go back to school after she and her husband welcomed the birth of their son, Patrick, in 2011. "There's something about education that stands out to me because it is that portal to a new life," Joliet said. At Penn State, Joliet said she discovered her passion for helping others, especially her fellow veterans. She became involved as an advocate at Penn State's Collegiate Recovery Center. "It was in hearing how these students had overcome their addictions that I learned how to ... maintain recovery over my own," Joliet said. Joliet graduated with a 4.0 grade point average and was honored by the school as the 2017 Outstanding Adult Student. She has accepted a job with the Penn State Collegiate Recovery Community and will also start graduate school next week. 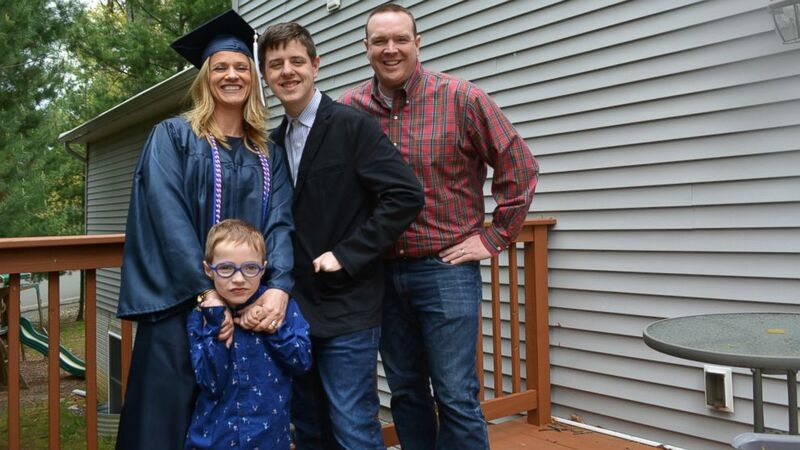 "If the 17-year-old version of myself could see me today and someone told her ... 'You would be graduating the top of your class at Penn State,'" Joliet said. "I would have never believed it." Randy Joliet, 15, told ABC News that seeing his mother graduate inspires him to want to go to college one day. "It is definitely super inspiring to go to college now that I know my mother has done it,” he said. Joliet credits her two sons and her husband with giving her the "grace" and the confidence to be able to "reframe" her life story. She hopes her sons learn from her example that there is always the chance in life to take a new path. "I want those boys to know that the ability to reframe their story will always be there, that they can take something negative and turn it into something positive," she said. "And that there’s always a lesson to be learned." "GMA" surprised Joliet with tickets for her whole family to see "Charlie and the Chocolate Factory" on Broadway and enjoy a dinner at Carmine's restaurant in New York City's Theater District.